It's 90 degrees in the Arctic Circle this week. Here's why. The Arctic Circle — the realm of polar bears and dwindling sea ice at the top of the world — hit 90 degrees Fahrenheit, 32 degrees Celsius, this week. This was the temperature in Banak, Norway on July 30, though some Norwegian areas even reached a couple degrees warmer, according to the European meteorology site severe-weather.eu. Banak sits atop northern Europe, over 350 miles above the bottom edge of the Arctic Circle. SEE ALSO:A judge threw out another climate suit against Big Oil. But the real battles lie ahead. The greater Northern Hemisphere and Europe itself have been repeatedly scorched by both record and near-record temperatures this summer, a consequence of overall rising global temperatures. In the past 40 years, Earth's climate has experienced an accelerated warming trend, which adds an extra level of background warming to hot spells — making heatwaves more extreme, climate scientists have said. And the heat at the top of the world really drives that home. A view of the Blomstrand Glacier, on June 16, 2016, in Ny-Alesund, Norway. US Secretary of State John Kerry and Norwegian Foreign Minister Borge Brende toured the glacier, and made remarks about climate change. Kerry is visiting Norway's extreme north to view areas impacted by climate change with melting ice and the opening of new sea lanes. Sunlight shines just after midnight on a fjord near the Norwegian Arctic town of Longyearbyen, April 26, 2007. The sea water is normally frozen solid at this time of year but global warming may be warming the region. Wild reindeer forage for food on the island of Spitsbergen on the Svalbard archipelago in the Arctic circle as the Norwegian islands enter summer 'midnight sun' season. US Secretary of State John Kerry (L) and Norwegian Foreign Minister Borge Brende (C) make a tour of the Blomstrand Glacier on June 16, 2016, in Ny-Alesund, Norway. Kerry is visiting Norway's extreme north to view areas impacted by climate change with melting ice and the opening of new sea lanes. A reindeer walks on snow on June 4, 2010 in Ny-Alesund in the Svalbard archipelago. Dutch scientist Appy Sluijs enters a cave at the bottom of the Longyearbyen glacier April 25, 2007 which has been shrinking fast in recent years. Many experts link the thaw to global warming. Screen grab from video I shot shows UN Secretary General Ban Ki-Moon pointing towards glaciers in the distance as Kim Holmen, research director at the Norwegian Polar Institute, shows the UN chief around the atmospheric measuring station in Ny-Aalesund, a climate change research station on the Norwegian island of Svalbard 0n September1, 2009. Ban is on a two-day trip to the Arctic Circle to see first-hand the effects of climate change ahead of key international climate talks in Copenhagen in December. A reindeer is pictured on June 4, 2010 in Ny-Alesund in the Svalbard archipelago. The sun shines low in the sky just after midnight over a frozen coastline near the Norwegian Arctic town of Longyearbyen, April 26, 2007. The sea water is normally frozen solid at this time of year but global warming may be warming the region. A photo of what appears to be Scandinavian folks taking a dip in a river while reindeer — the cold-adapted, antlered, herbivores — cooled off in the water beside them is perhaps the best example of just how hot it is in parts of the Arctic Circle right now. The "warm season" in Banak is short, lasting around three months, but the very warmest day of the year, around July 23, is usually around 62 degrees Fahrenheit — about 30 degrees cooler than temperatures there now. Overall, temperatures in northern Europe are between 14 to 21 degrees Fahrenheit, 8 to 13 degrees Celsius, above average. All-time temperature records were set in both Norway and Finland on July 30, including 86 degrees Fahrenheit, 30 degrees Celsius, in Verde, near Banak, though extreme or near-record temperatures blanketed the region. Persistent heat and dryness this summer have transformed normally verdant European countries into brown and yellow lands, and the continent's extreme heat is expected to persist. 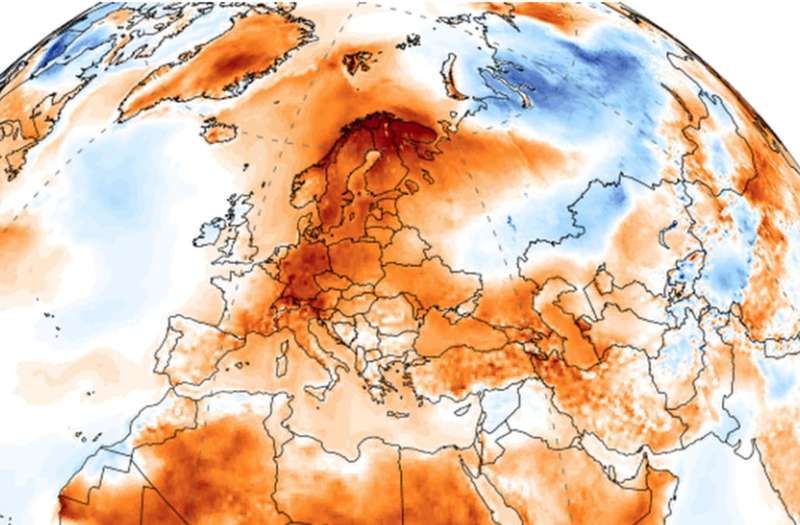 The UK's Met Office and severe-weather.eu both forecast temperatures that might break Europe's all-time heat record of 118.4 degrees Fahrenheit, 48 degrees Celsius, by the end of the week. Meanwhile, across the planet, extreme heat has enhanced wildfire activity in the western part of the United States, even stoking a rare and imposing fire tornado.